Hello and welcome to Rajshri food. Today, I'm making a very delicious dessert for sugar conscious people. 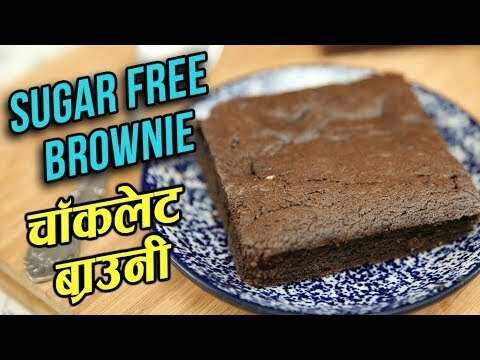 Which is Sugar Free Chocolate Brownie. For the dry ingredients, I have 1 cup flour that I have sieved. To this, I'm adding 1/2 tsp baking powder. I have sieved all these ingredients, or you can mix everything and then sieve it. 1/2 a tsp soda bi carb. All our dry ingredients are mixed, let's keep them aside. Let's mix our wet ingredients now. And instead of sugar I'm using 2 mashed, ripe bananas. Now, I'm adding 1/2 a cup melted, sugar free chocolate. You can melt it in the microwave or use a double boiler. Next, we add 3 tbsp butter, this was kept at room temperature. Next, I'm adding 2 tsp sugar substitute. You can add any sugar substitute. Now, I'm going to whisk all these ingredients. Now, gradually add the flour mixture to this. Clean the bowl using a rubber spatula. So that all the flour on the edges also mixes into the batter. And our batter is ready. Do not over-beat the batter, just until everything is mixed. Here I have a 7" by 9" greased and dusted tin. So I have applied some butter and dusted the tin with flour. Now, let's transfer the batter to the greased tin. Spread the batter in the tin. Now, let's bake this in a preheated oven at 180 degrees for 15-20 minutes. It's been 20 minutes and the brownie is ready, let's remove it from the tin. With the help of a knife, loosen the brownie from the tin. And then, let's unmould it on the wire rack. Let's flip it once again. The brownie is ready, allow it to cool for at least 2 hours. When you want to serve it, cut it into pieces and with the help of a microwave..
..warm it for 10-15 seconds and then serve it. Do try it and please let me know how it turned out. See you next time, buhbye.